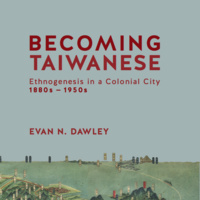 Evan N. Dawley, historian of East Asia and colonialism, will speak on a chapter from his recently published book (Harvard Asia Center Press, 2019), in which he argues that residents of Taiwan who held ancestral roots in southeastern China developed a new ethnic identity for themselves when faced with colonial control by Japan and the Republic of China. He does so through an urban social history of the port city of Jilong (Keelung). His talk will focus on the centrality of religion, and one religious festival in particular, in this process of ethnogenesis.